What an adorable card! I'm planning on purchasing this set and your post gave me a great idea. I am a GS leader and several mom's in the troop scrapbook and stamp. I can get the set and let the girls make some neat cards and send the deets about the stamp set home with them. You inspire me on so many different levels! This card is beyond BEAUTIFUL, I don't know the word, but it is it!! TFS. PS: How's your ankle feeling?? I love your awesome card! Terrific coloring, and I love the sparkle! I need to try one of these tall & skinny cards. Look at you! Helping by making more beautiful cards for this special cause and then still donating your own money for this cause. All this while you are running a business, being super Mom and unable to walk. Thank you! You're an angel! 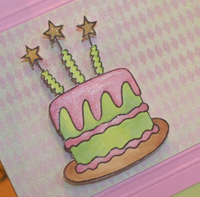 Your card is adorable and your coloring looks so yummy my sweet tooth is craving cake now! I ordered this adorable set this morning and can't wait to get it. Love your gorgeous examples! Ellen, this is sparkletastic!!! I love the fun glittery look and so happy that your girls are having fun with your stamps. My girls would love this set too!